How do we guarantee safe delivery of energy at reasonable costs and quality? How do we solve the problems of the existing supply grid related to the new situation? This questions are legitimate because, firstly, the energy of renewable sources is normally not controllable (in the best case predictable), and secondly, the supply grid is not developed for the resulting energy flow (this leads to several different problems). Especially for SMEs (small and medium enterprises) is the safe energy supply at low costs very important. Short breaks of the supply can lead to high costs (e.g. for restarting of production lines) and comparatively too high costs for the supply leads to competitive disadvantages. Microgrids can provide options to reduce these problems beside many other benefits. 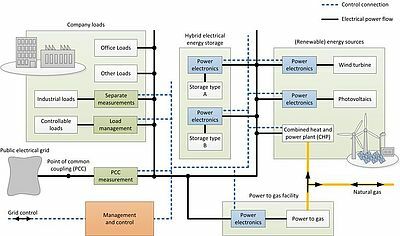 A microgrid consists of sources, storages and loads of electrical (and other) energy which are mostly connected via power electronic converters. 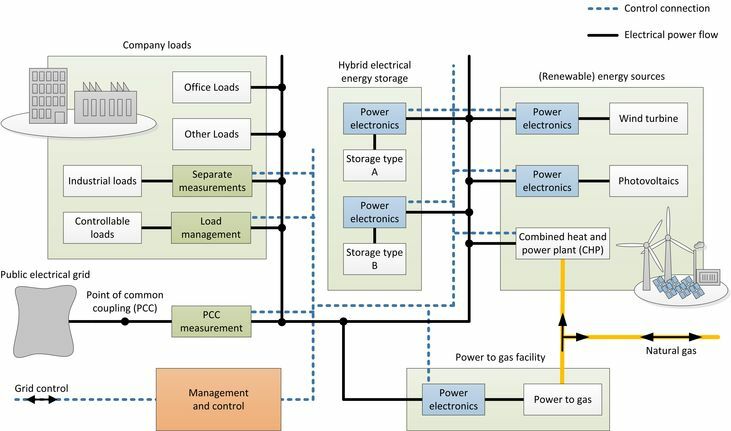 The control of the power flow in such a microgrid is carried out by operation algorithms which are implemented in a central controller. The main controller also utilizes forecasts and information like weather data. The reference values of the central controller are distributed to the local power electronic converters. The control loops and the topologies of the local converters are also adapted to the requirements of the microgrid. Special tasks for this distributed control systems are the stability assurance within the grid and active filtering.